There’s nothing that says “still in active development” quite like a healthy colony of interface, progression and mechanical errors popping up every week. We have mixed feelings about the number of these little guys that are still cropping up, but at the very least it means that we have a regular bunch of sharp-eyed forum users who have nothing but our best interests at heart (at least until we finally discover what secret agenda has kept them playing the beta for all this time). So, this week’s changelog is a nice chunky example of what happens when we panic and realise that a three-update-buildup of game issues is busy glaring at us more furiously than a level 10 Meat Man’s death prediction glow. We’ve been inserting more graphics and animation tweaks this week while gaining steam on more behind-the-scenes stuff (hint: a certain Danny “Lithuanian and proud” Baranowsky and Grant Kirkhope are really excited about the version of DD they’ll be seeing this weekend). 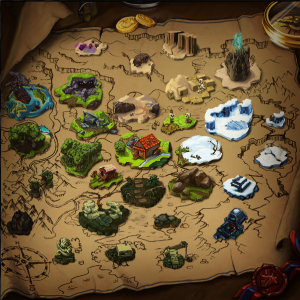 Okay, technically the map has been in for a really long time already. But now it actually looks the way we want it to. 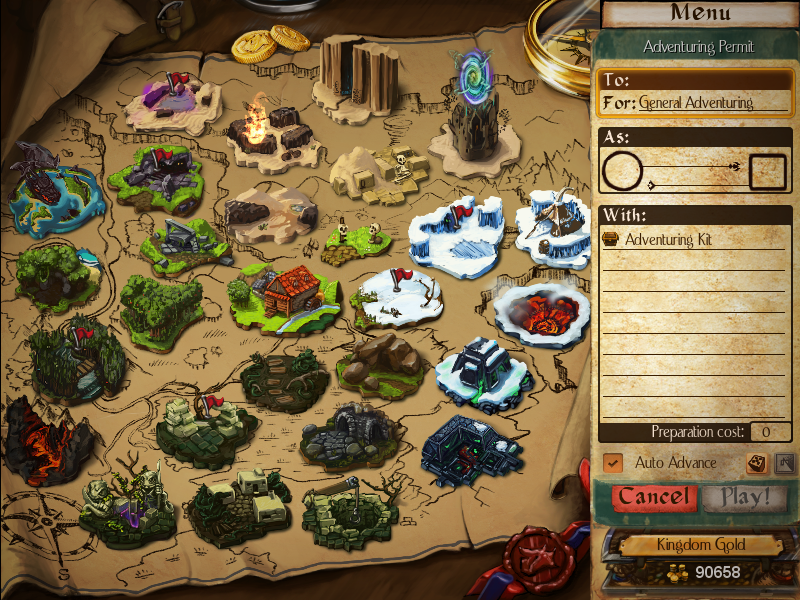 That’s right, the realms of Desktop Dungeons are no longer a barren waste of parchment-coloured desert and dirty brown dungeon buttons. The same treatment that our Kingdom screen recently enjoyed now extends to the full game world, revealing a magical adventurescape of vibrant colour and custom-drawn hazards. Hooray for that! 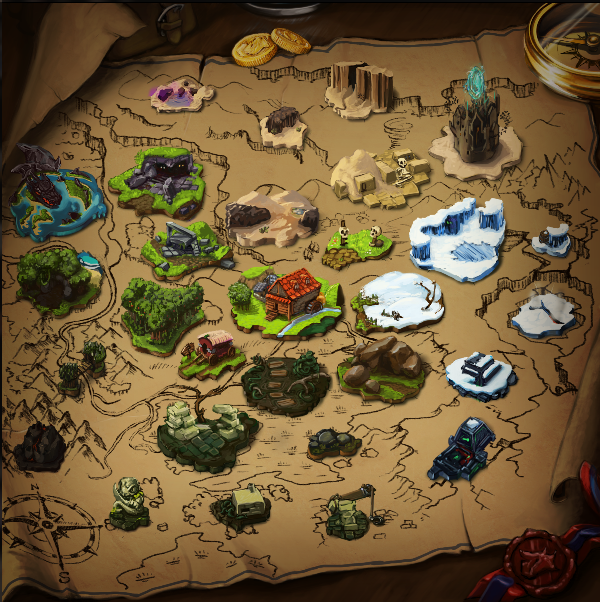 Our new Kingdom map is nearly ready for in-game awesomeness! We just need to finish up the different states required for all of the dungeon graphics (yep, they have different appearances based on completion criteria), then it’s off to plugging them in and watching them go. In the meantime, open up the in-dungeon menu when you have a moment and check out the cool new badge graphics we’ve got for you! Finally, your unique and hard-earned dungeon achievements have been honoured with equally unique and hard-drawn dungeon badges from our unique and hard-pressed dungeon artists! This has been another week of text fixing, with a bit of narrative improvement and some flesh-out-ness when it comes to lore and Exclusive Edition content (several EE characters so far being dispensers of this additional lore, so keep an eye out for them). From a UI perspective, we should have dealt with that pesky bottom cut-off problem that’s been plaguing the Kingdom’s dialog boxes for a few weeks. Please send us a report via e-mail or our gigantic thread o’ bugs if you still encounter graphical glitches. Screenshots are always helpful in these cases. 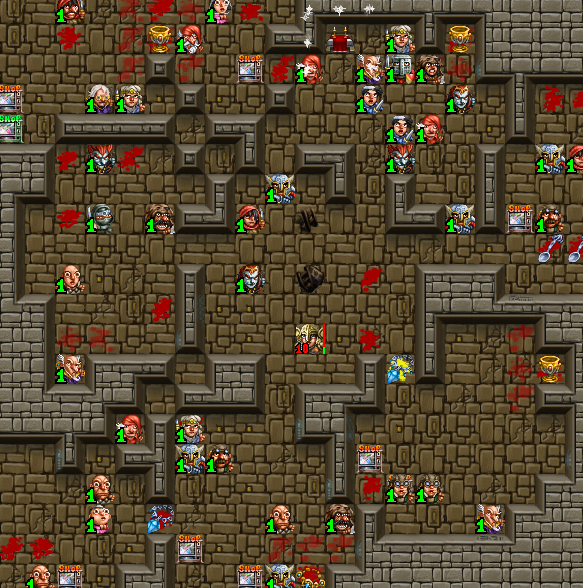 Aside from that, there’s been a few minor in-dungeon tweaks including a BLUDTUPOWA / Goatperson nerf. Not our idea, honest. This one’s on you guys. Good news! We’ve made some sweeping, game-wide tweaks this week and players of all levels and Kingdom progressions should see some improvement in today’s update. 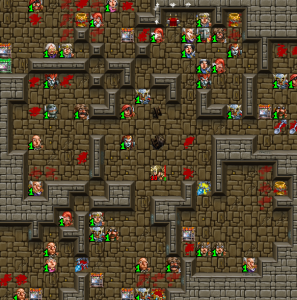 The new animation system is gaining momentum and we’ve been focusing on making everyday dungeon interactions like fighting, killing and piety gain that much more visceral and satisfying. It takes time, but the effort has been well worth it so far. The general dialogue went through a considerable overhaul. Most of it is subtle reorganisation and condensation. Portraits, icons and character sprites have been corrected and updated. A few more advanced tutorials have been put into place. Lore and codex adjustments have been made. Et cetera et cetera. These past few days have really been an eye-opener regarding just how much text exists throughout the game. 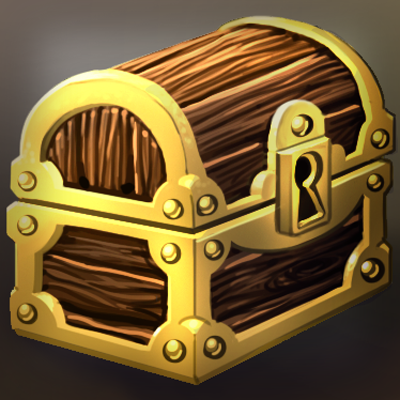 We’ve also done our best to improve information flow, particularly with player gold. Two important changes in this regard are the new once-off advisor tutorial replacing the annoying gold cap popup in the Kingdom, and the ability to preview monster trophy values in-dungeon.